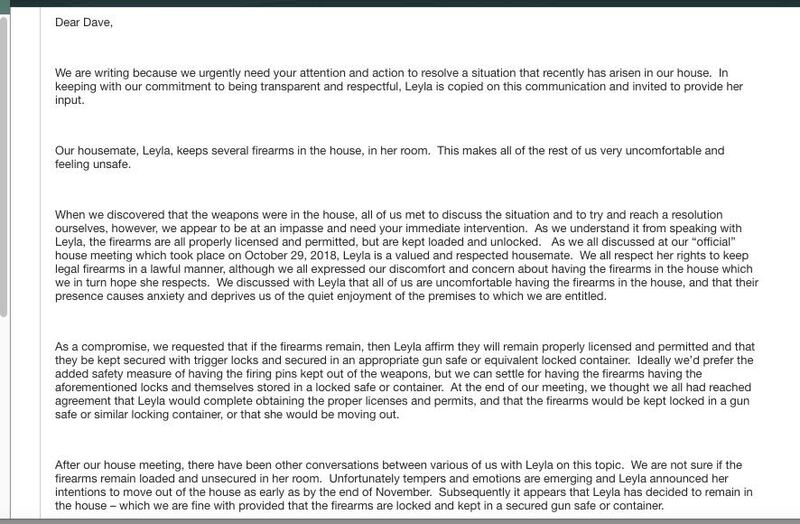 “[S]ince it’s clear that Leyla wants to keep her firearms, it would be best for all parties if she finds another place to live,” Dave Lewis, president of Avid Management, said in an email to Pirnie and her roommates. The admonition that she move out came after her roommates searched her room while she was not at home and found her guns, which prompted one of the roommates to email Lewis requesting he verify that Pirnie was in compliance with applicable firearms laws. Pirnie said she feels her roommates not only violated her privacy, but now they and her landlord are trying to violate her constitutional rights. While she was given various explanations for why her roommates entered and searched her room, Pirnie said she felt her political beliefs and where she is from played a significant role in the roommates’ actions. Pirnie said she had been living in the apartment since September without incident, and she kept her political beliefs to herself before the incident. But she did have a Make America Great Again hat in her room that seemingly set her roommates off. 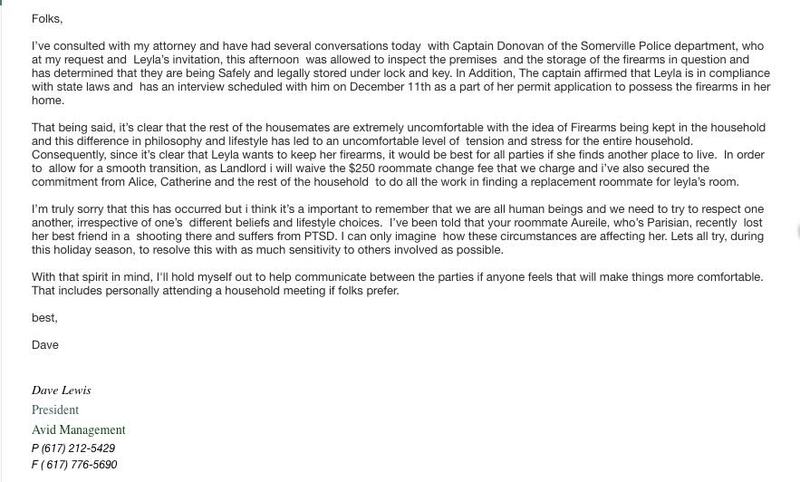 After that search of her room and the initial email from the roommate, Lewis contacted Captain James Donovan of the Somerville Police Department to inspect Pirnie’s guns and ensure they were in compliance with the law. Pirnie consented to allowing the police to inspect her firearms, after which Pirnie said she was told she is indeed in compliance. He then cited “this difference in philosophy and lifestyle” and “different beliefs and lifestyle choices” as reasons Pirnie needed to move out, adding that she was causing “stress” for her roommates. Pirnie has taken the position that her landlord’s concern over her roommates being uncomfortable with legally owned firearms is misplaced and that his request that she move out is inappropriate. She also turned their complaint right around on them. Pirnie said her motivations for owning firearms have been ignored even though she shared them with her roommates. While an undergraduate student, Pirnie said she was in a physically abusive relationship and that harrowing experience is part of what drives her to be legally and safely armed. After the landlord’s email, Pirnie and her father rejected Lewis’s request that she move out in the middle of studying for finals. He then warned that the other roommates could simply move out and Pirnie would have to pay their rent. “If the other roommates were to move out, Leyla would need to find roommates to share the place or foot the entire $6000+ monthly rent herself,” Lewis wrote. The bottom line is that Pirnie feels she is being punished for being a lawful gun owner.